All classes are in Andover. To book your place, please check the availability of spaces below, and then make your payment. The classes run every week on the same day which is stated next to the location. You can book when there is a space. The number of spaces available is to start in the next class, unless another date has been specified. If there is a waiting list, or if you have a question about the class or booking not already answered on this page or our FAQs page, please get in contact. Please note that all Courses, Parties Lessons must be pre-booked and paid for in advance, please do not turn up without prior warning. Please read the terms and conditions on the T’s C’s page before booking. Freestyle Friday is a chance for you to let your hair down, and unwind from a busy week. By taking the new moves from this weeks classes, along with your old favourites since starting pole, you can enjoy the freedom Freestyle Pole gives you. Everyone picks a song, so you get to dance to one of your favourite tracks! You can even be on the rota for our super fun “Make It Rain’. We aim for up to 6 songs in this class. If Freestyle Friday sounds a bit daunting, you can try Learn to Freestyle instead. With mini combos, and inspiration given throughout the class, you can brainstorm moves before dancing to each track. Areas covered are Wind ‘n’ Grind, Floor Work, Spins and Transitions, with a chance to Freestyle at the end. We aim for up to 4 songs in this class. 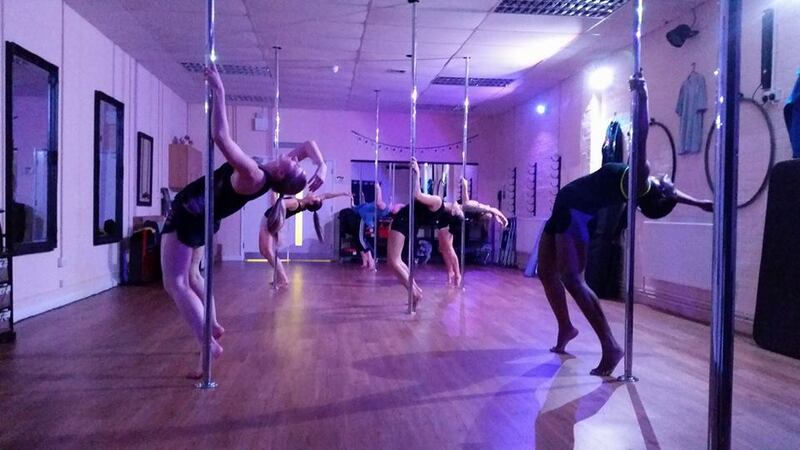 So long as you have completed a Beginner Pole Dancing course with Purity in the last 6 months, you can join either the Freestyle or Learn to Freestyle classes. You can join on going lessons at any time as long as its not booked up. From 1st January 2010, cheque payments can no longer be accepted, cash needs to be paid in advance of starting. You are welcome to contact Purity to set up a Bank Transfer or Standing Order. This location for pole dancing normally has people traveling from the surrounding areas of Andover including, Salisbury, Whitchurch, Winchester, Romsey, Ludgershall, Amesbury, Tidworth, Basingstoke, Newbury, Eastleigh, Southampton, and other parts of Hampshire, Surrey and Berkshire.